2pm-9pm. All ages. 21+ to drink. DJ Rasp: DMC UK Supremacy Champ (England) and more! Judges: DJ Precision, DJ Rasp, Marcus + more tba! NO FILMING. Still photography ok! DJS MUST REGISTER TO BATTLE by answering each of the following questions and send them to DMC USA’s Christie Z at [email protected] BEFORE April 4th, 2019 11:59pm EST. No walk ups. DJs can enter as many battles as they like. All ages can enter. Website, insta, facebook, twitter, etc. Are you a US Citizen or have lived in the US for at least 6 yrs and can prove it? Equipment: Rane Seventy Two or Sixty Two mixers. Other Rane mixers may be available upon request. Rane mixers will be supplied by DMC. DJs must bring their own headphones, slipmats, needles, records, laptops, cords, control vinyl and/or laptop stands etc. No dicers permitted. Promoter/sound will supply Technics turntables. 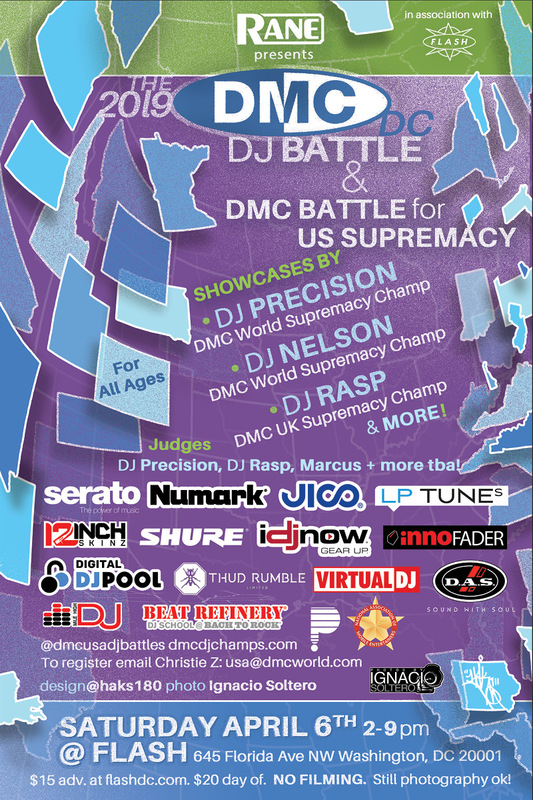 The DMC DJ Battles are the biggest, longest running most prestigious DJ Battles in the world. From DMC battles, legends are made. 2019 BATTLE FOR US SUPREMACY: DMC's traditional head to head DJ battle. DJs can use DVS and/or vinyl. If there are more than 8 but less than 16 DJs, we will have a 2 min. elimination round to qualify. Early rounds are 2 x 1 minute each with the semi finals and final being 2 x 90 second rounds each. Toltech is invited to defend his national title at the 2019 DMC Battle for US Supremacy. The champion of this battle will advance to the 2019 DMC Battle for World Supremacy. More info tba.